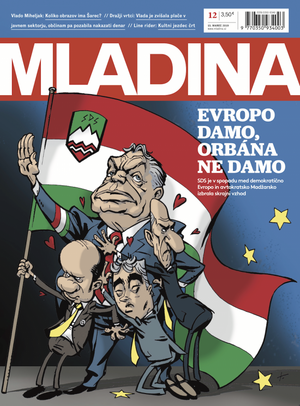 Slovenian newspaper Mladina published its 22 March issue with a cover illustrating a story about the Slovenian far-right defending Fidesz in the European People's Party with a cartoon depicting Viktor Orbán performing a Nazi salute while Slovenian far-right politicians protectively surround him. "Therefore the Embassy of Hungary in Ljubljana protests by the Ministry of Foreign Affairs of the Republic of Slovenia against the politically irresponsible cover of the Mladina weekly and requests the assistance of the esteemed Ministry to prevent similar incidents from happening in the future." Of course, the Slovenian Ministry of Foreign Affairs responded by saying that Slovenia had always consistently respected the freedom of speech and of the press and has never interfered in the editorial policies of Slovenian media. Mladina's editor-in-chief commented that "a country which dares to demand from another one to act against journalists means a serious security threat to the entire region." Hungarian business circles affiliated with Fidesz are expanding their media portfolios in Slovenia as well. 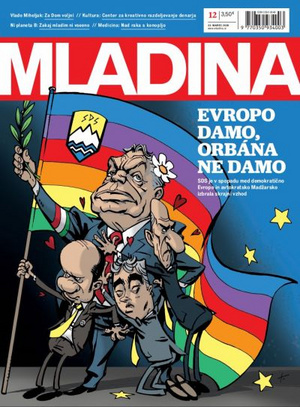 Circles of Orbán's informal advisor Árpád Habony - through Péter Schatz, formerly of Hungarian public TV - own Nova24TV and political weekly Demokracija, which two media outlets have been campaigning strongly for Orbán's EPP allies, the far-right party SDS (also featured on the cover of Mladina).